We also FINALLY got in a game of Forbidden Stars – a game from Fantasy Flight Games set in the grim dark universe of Warhammer 40,000. 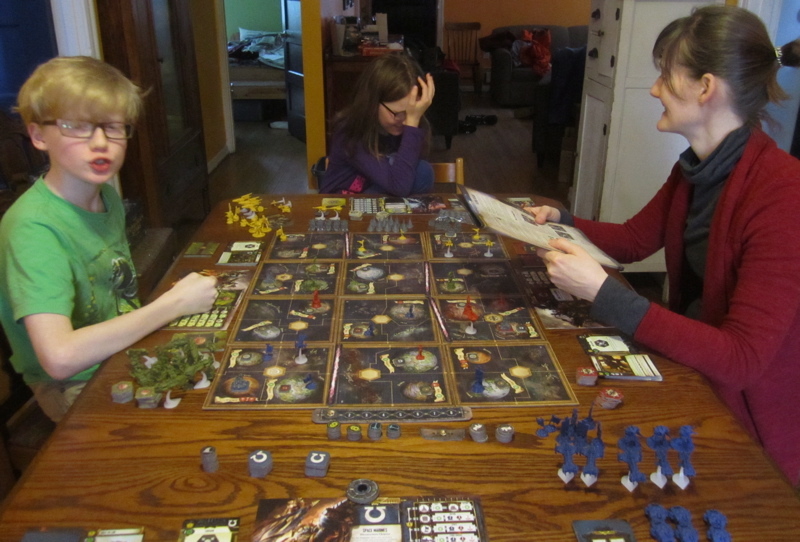 I played the Imperium, The Boy played the Orks, The Girl played the Eldar and Amanda played the forces of Chaos. 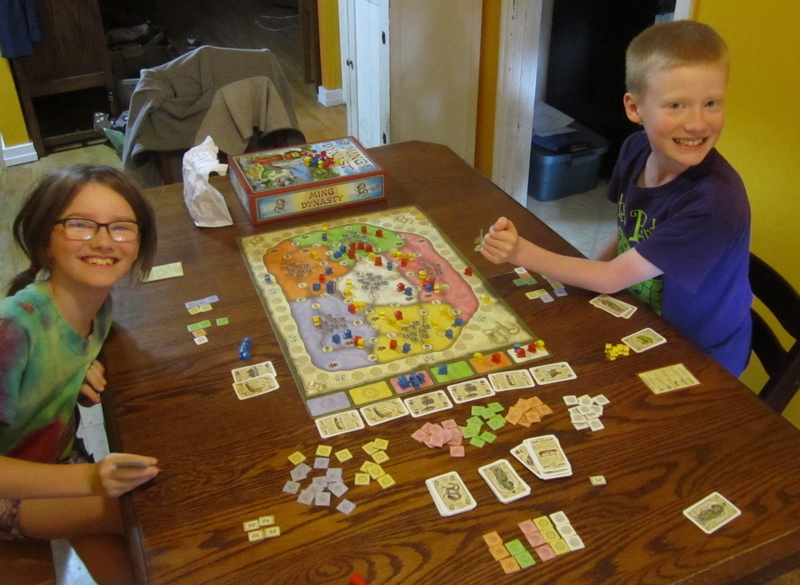 It took a LONG damned time to set up and sort out the rules… It took even LONGER to play… It was really fun though! There’s a lot going on in this game – I feel like it will take a few played to figure out the various strategies… but at 4+ hours to play… I’m not sure I’m going to get in all that many games!? … and then there’s this guy… He’s not for 40K. And totally not form Games Workshop. I think he came from Crooked Dice. 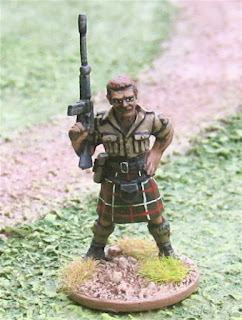 I have no idea who he’s supposed to be, but how could I pass up a dude in a kilt with an SLR!? I did get in a game of Frostgrave on Sunday – hopefully I’ll get a game report of that up sometime this week. Also we finished Volume Three of Story of the World, so I have another Gaming Our Way Through History post in the works. You can probably expect the usual look back at the past year and plans for next year posts in the next week or so. 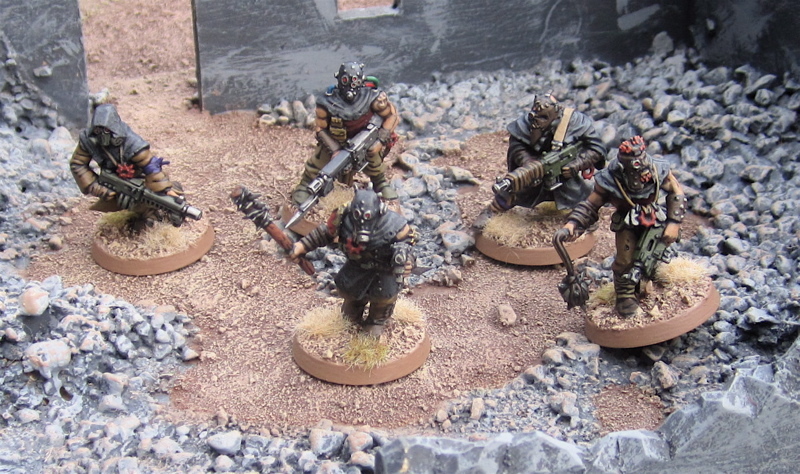 And I have a pile of other stuff on the workbench that just needs a bit of finishing up – Jungle Fighters, etc. Back in July I posted Gaming Our Way Through History: Part 1 - an article about… well… gaming my way though history with my kids as part of their studies in world history using The Story of the World series of books by Susan Wise Bauer (from Peace Hill Press). 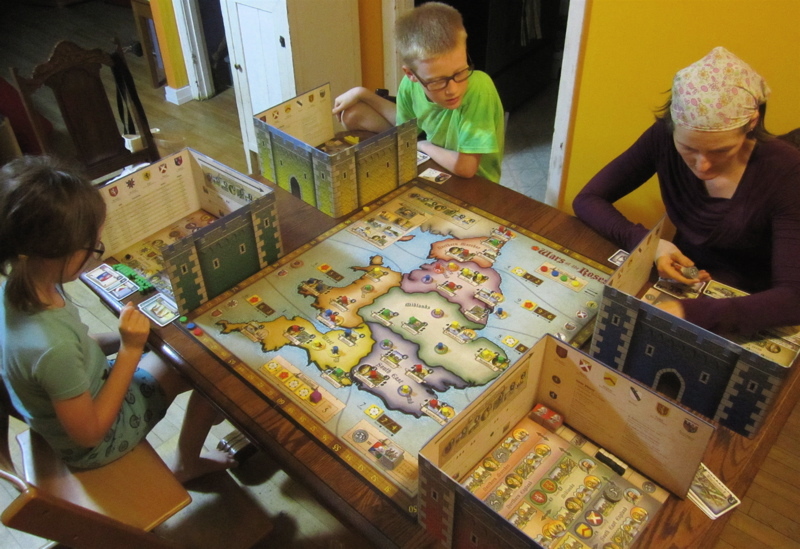 Gaming Our Way Through History: Part 1 covered the ancient world and corresponded with Volume One of the series of books. This second part corresponds with Volume Two of the series, which covers the medieval world from the fall of Rome to rise of the Renaissance. We actually finished the book months ago but a clever combination of procrastination and hope that I might get to play a few games I’d hoped to play but didn’t at the time we were reading about it kept me from getting this done. As we’re about to finish up the third Volume this afternoon, I thought it best I get to posting this as I’ll have one for Volume Three to finish up shortly! There wasn’t really any mention of Ireland in the books so far – but Volume Two did start off with Early Britain after the Romans left… and that fairly close…? 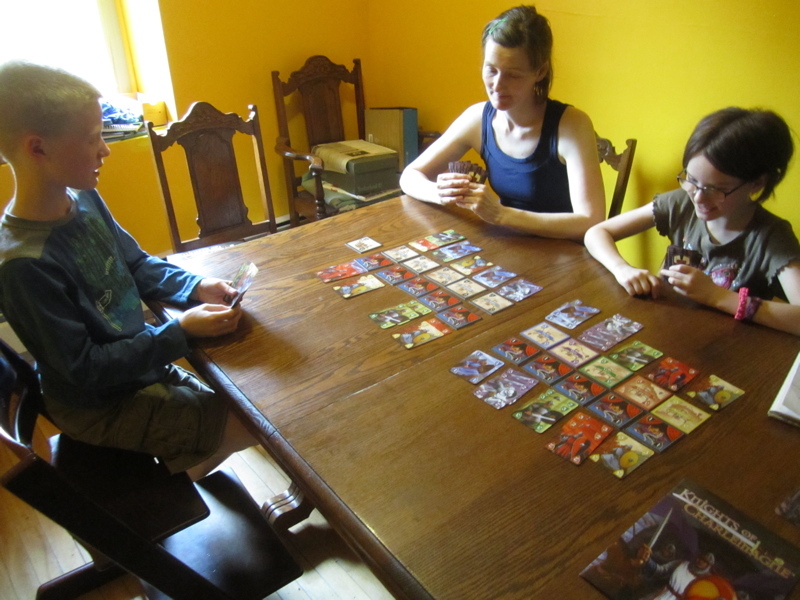 While most of these games were played at the time we were reading about the relevant period of history, this one was not… it was one of the last ones we actually played and didn’t get to play it until we were well into volume three – this is because the game wasn’t released until late September. 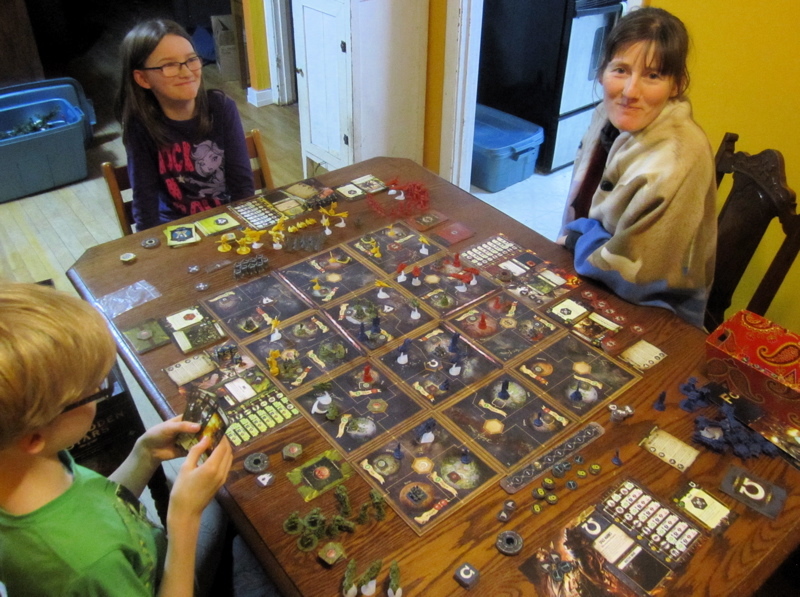 The game is Osprey Publishing's first foray into boardgames. In the game King Arthur (the “historical” King Arthur) has just died and the players represent members of the King's court trying to gain influence among the Welsh, Scots, and Romano-British to unite them against the invading Saxons (and, ultimately, get themselves crowned King – or Queen!). Well... that's the fluff anyway... It had a nice map showing historical political regions of the period. While I thought the game was really interesting, the play itself was quite a bit more abstract that I was expecting from Osprey. The decisions being made weren’t decisions a noble member of a royal court would be making, they were about which card to play when to get the most coloured cubes in an area. We played it a few times. 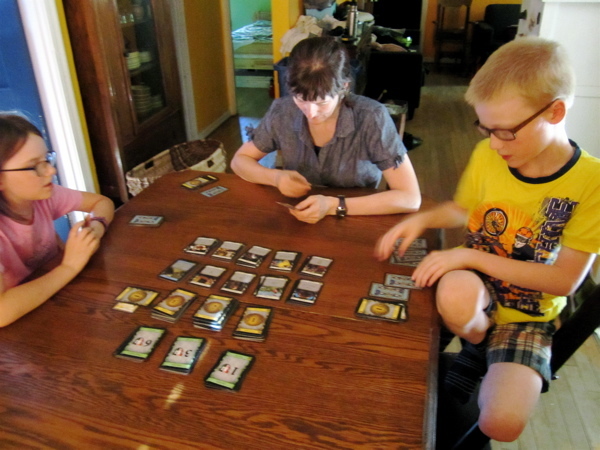 The game itself seems fairly deterministic – there is very little randomness (other than the draw of shipping cards) and very little player interaction – you never trade with each other and there is virtually no way to mess with what other players are doing – other than scooping up limited properties before other players can. Everyone starts with the exact same stuff and just tries to gather as many victory points as they can before the game ends. While we’ve played it a few times and been able to try out different strategies, I feel eventually one would figure out the best way to do it and there would be little else one could do. In addition to the chapter on Charlemagne, we’d read Charlemagne and the Paladins - one of Osprey Publishing’s Myths and Legends books – which do a pretty good job of looking at various versions of the legends they cover and tying them into the actual historical events that may have inspired them. While not at all historical we did read about the Tales of the Arabian Nights in The Story of the World - when we read about Abu Bakr and the spread of Islam and Bagdad becoming the center of the Islamic Empire. It was a very LONG game in which we each took on the role of one of the Heroes or Heroines of the tales and went on adventures around the world that was known to the traders and explorers from the middle east. 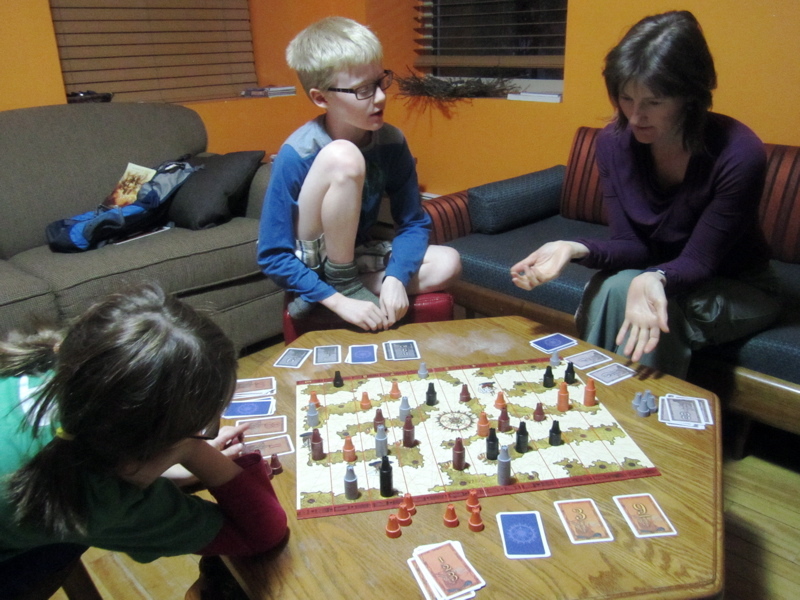 We played it in the summer and I made no notes at the time - I remember it being fun, but taking a LONG time to play. You had to gain a certain number of some sort of points before returning to Bagdad... I remember thinking we could have played to half the number of points and it still would have been a fun and challenging game, but wouldn't have taken so dang long! As with Knights of Charlemagne this was thematically pretty light and fairly abstract… based more on legend than anything historical, really - but we did read about King Arthur in The Story of the World, so.... It is a card game where you take turns playing cards in sets of matching colours of a number equal to or greater than the foe you want to beat (many of the foes are mythical creatures – Dragons, etc…). once you have defeated foes you can use them to gain trophies, which get you victory points, which determines the winner at the end of the game. The game is supposedly set in the 1265 (Second) Baron's War where a number of Barons led by Simon de Montfort rose up against the King of England in an attempt to reassert the Magna Carta. In the game player's play a Baron and their retinue and basically try to kill their opponents and control cities around Evesham to gain victory points... the board is modular (and thus could be different every time you play – which might be great for replayability, but not great for learning historical geography) and theme is pretty weak and there's this totally random, plan-wrecking, plague/fog phase that utterly frustrated everyone. 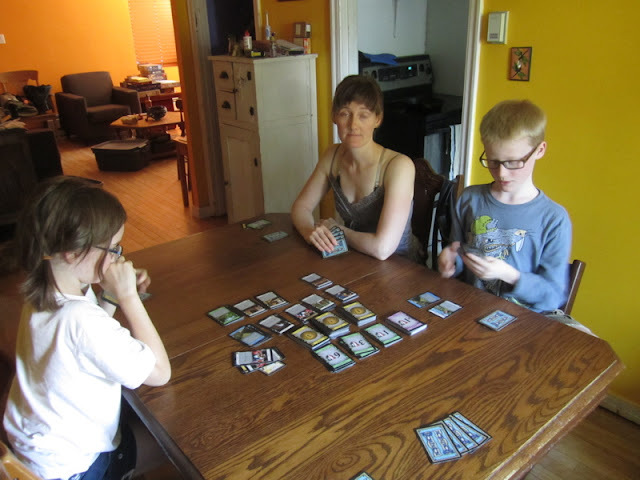 One of our most played games this year was Dominion. I've included it here because we played it while we were reading about medieval times and it has a medieval theme... sort of... you are supposed to be a monarch and trying to gain control over lands and titles. Great game - played it lots - not much history there. Looking to the east we read a bit about the Ming. This was a fairly abstract game Where you had to draft cards you would then use to move your diplomat around the kindgom trying to gain influence in towns and regions. San Gimignano - playing the heads of aristocratic families trying to build the most towers in the medieval town of San Gimignano... (now a UNESCO World Heritage Site). The game plays super quick - so we played it twice! 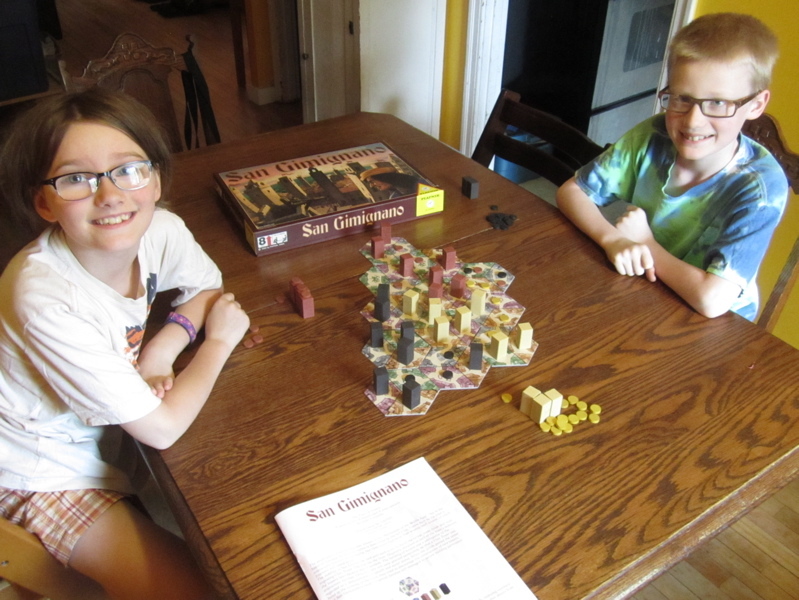 This, our second game, was much higher scoring and much closer – The Boy eked out a win with 8 towers to the 7 towers that both The Girl and I managed to build. 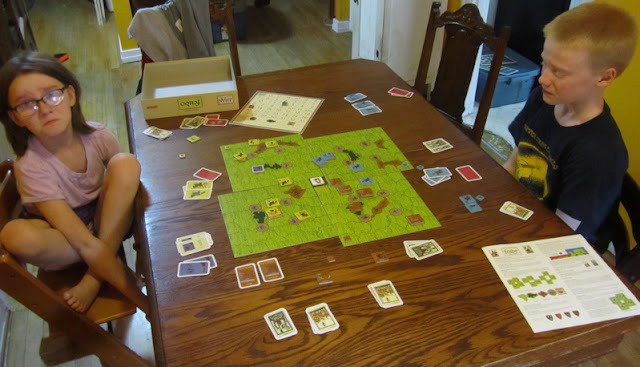 The theme was pretty weak and the game really just a fairly abstract strategy game involving area control through placement of tokens representing the families influence in the guilds and building of towers when you have influence in four different connecting guild areas. I’d posted this picture on facebook and my sister commented that she’d actually BEEN to San Gimignano during her trip to Italy a few years ago – they apparently have really good Gellato there…? This we ended up playing a little later – long after we were done reading about the period. Amanda and The Girl didn’t get to play this one as they were at dance class the afternoon I got around to organizing a game. The game isn’t tied to a specific historical event or location. 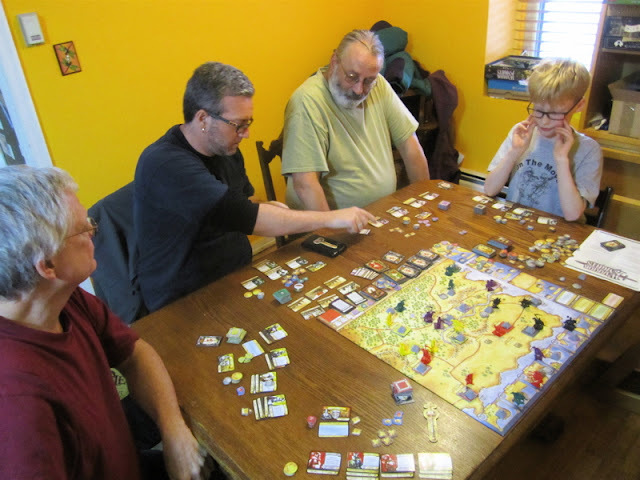 It takes place in a non-specified kingdom in which the king has died leaving no clear heir and the players represent the houses of various noble families within the kingdom with a claim to the throne – which is something that happened and we read about. While the Kingdom isn’t named, the map looks somewhat like Northwestern Europe and has names that sound like they could be French-ish cities… and the overseas areas you can send troops on crusades to (Constantinople, Syracuse, Acre, Jerusalem, etc) and place you can send expeditions to (Ceylon, Spice Islands, China) are all historical locations. In the game you have to end up controlling half the cities in the kingdom or have the most Influence points at the end of a set number of turns or when the influence pool runs out. Influence is gained mainly through controlling cities, but I have a feeling it could be gained elsewhere (it’s been a month since we played…). While there is a strong military component – gathering resources through taxation, building armies and trying to conquer cities, there is also a strong political element where players vie for various titles within the realm at the assembly of Barons – where various laws and titles are voted on by the players, which then have an affect on the game. Being the head of the Assemble – or the Head of the Church have considerable advantages. 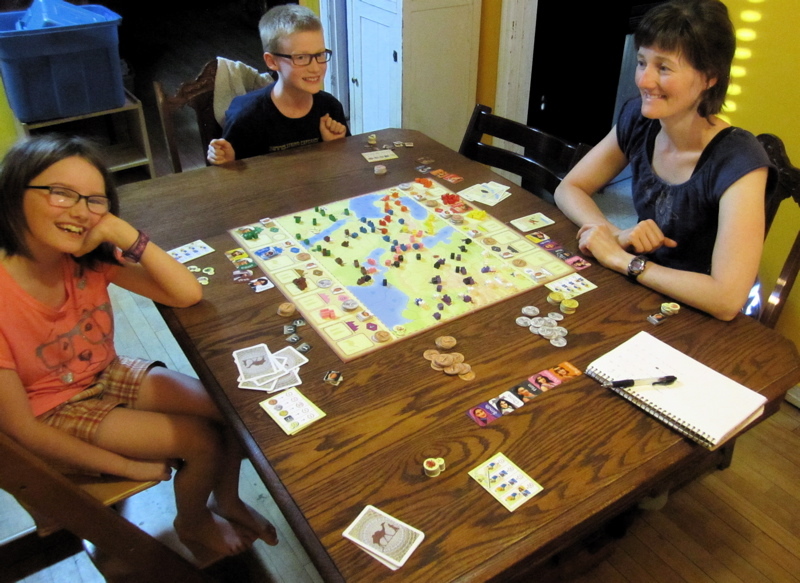 Playing out the Hundred Years war with Joan of Arc. The Girl was France, The Boy played England and I Had Burgundy. It can be played with up to six with the additional players being Flanders, Brittany, and Navarre - which would be a really fun game!! The long game (10 turns) with six players would be an all day event... but it would be wicked fun! Basically worker placement and influence gathering with a fairly strong 15th century theme... Henry V trying to consolidate power in England and go fight in France to win back lands lost earlier in the Hundred Years War. I though the game was fun and there were lots of choices and potential paths to victory. I started out really slow - but gathered up lots of friendly nobles, built up my knights and castle - all of which counted for HUGE points in the final tally... though it looked like I was trailing for the longest time because I wasn't going after quick points for fighting in France. 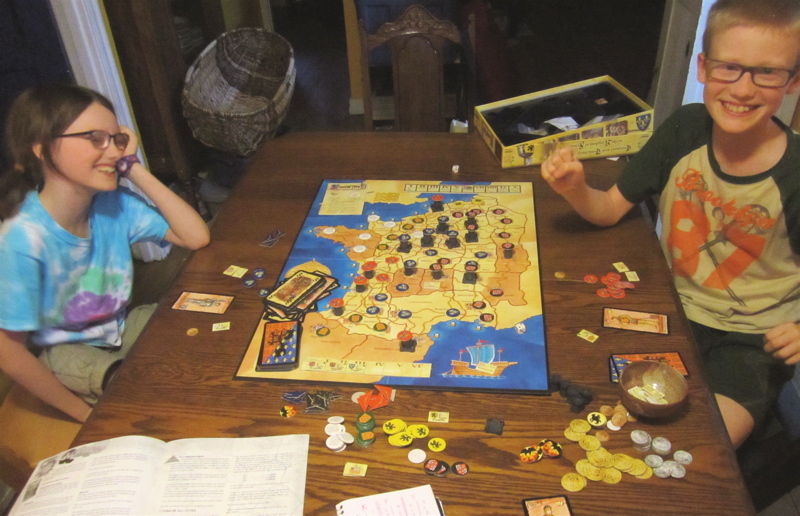 We also have the Lancaster: Henry V expansion, but haven’ had a chance to play it yet. I’d like to play just the base game a few more times before adding to it. This was a fairly complex (but fun!) game of planning, resource management, influence gathering and area control set during the Wars of the Roses. So much going on! 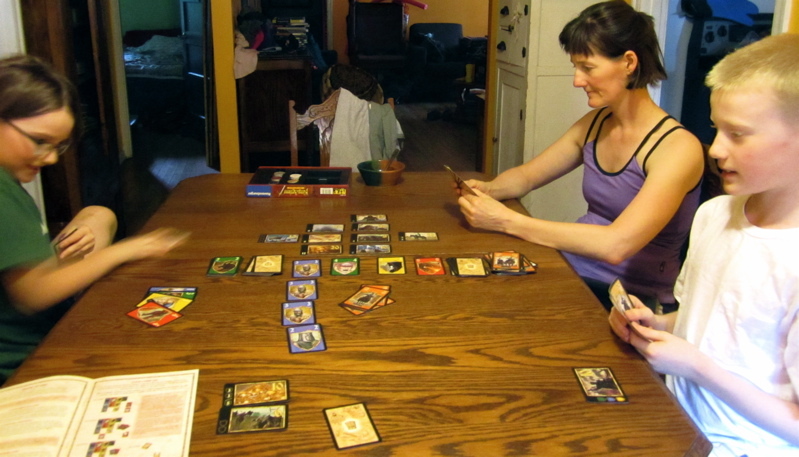 Cards were drawn at the beginning of the game to determine who everyone would be. Amanda and I were Lancasters and the kids ended up being the Yorks (I think I was King Henry VI and his followers, I forget who everyone else was... Edwards or Richards, I suppose...). So you kind of end up playing on a team, but points are tracked individually and there can be only one winner. Though, technically, a Lancaster was king at the end of the game in 1500 (Henry Tudor, I guess? ), the kids crushed us in the points race - Finnegan was miles ahead of everyone, Keira also had over 100 points and Amanda and I were back in the 80-90 range (me, being dead last)!? 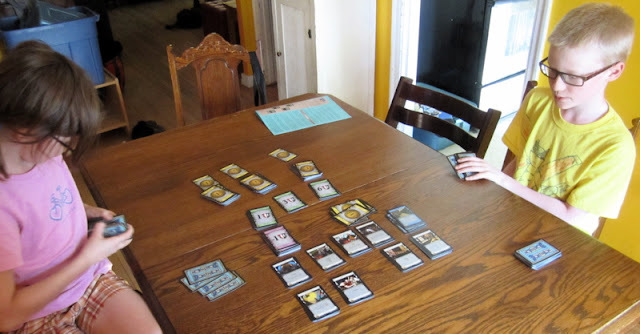 There was a clever system of resource allocation - which was done on an individual player board behind a screen so your foes could not see what you were up to. 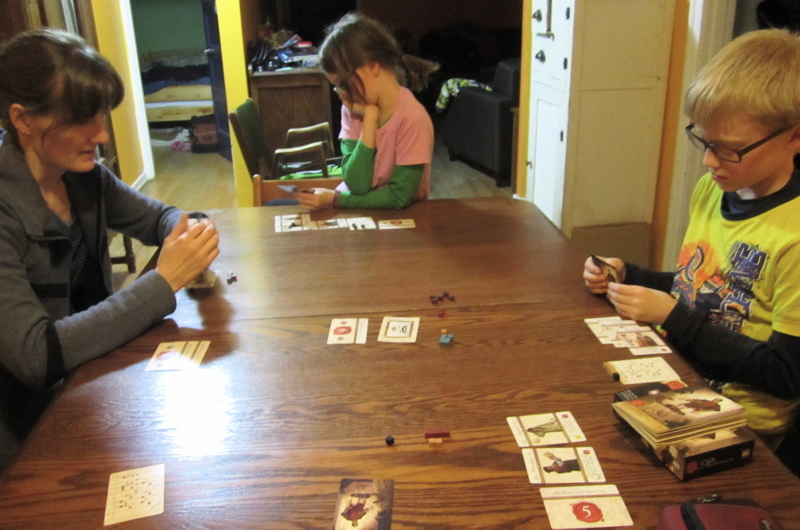 It’s been a couple months since we played it, but I recall the combat seemed a little deterministic. If I recall correctly it was basically who ever had the most stuff in the area won. While I despise combat mechanisms that seem completely random, I do like a bit of chance and randomness built into a system. There have been plenty of historical examples of smaller forces beating much larger forces through some combination of good leadership, guile, bravado, well-drilled troops able to execute precise maneuvers, and blind, dumb luck! 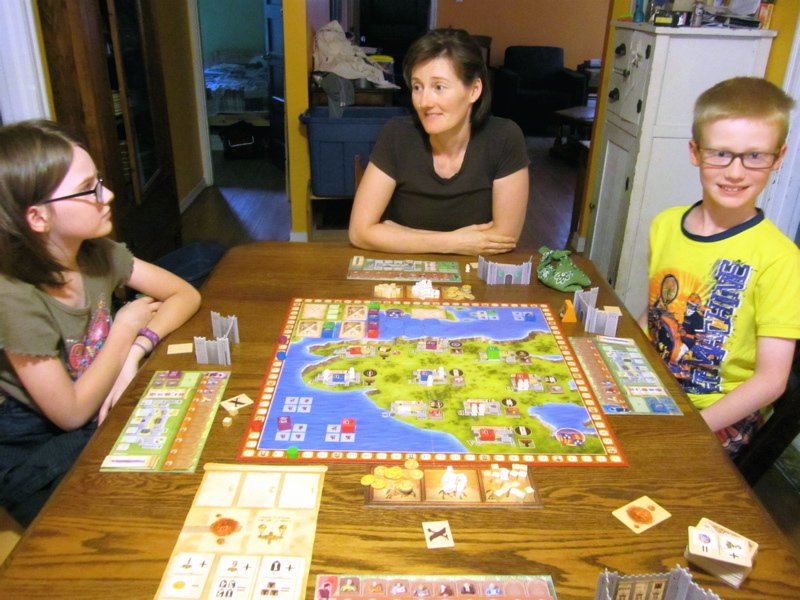 This was a fun game of building roads and cities and temples in Peru prior the Spanish invasion. The box description may be a bit off - it said it should take 1.5-2 hours to play... took us closer to 3.5... 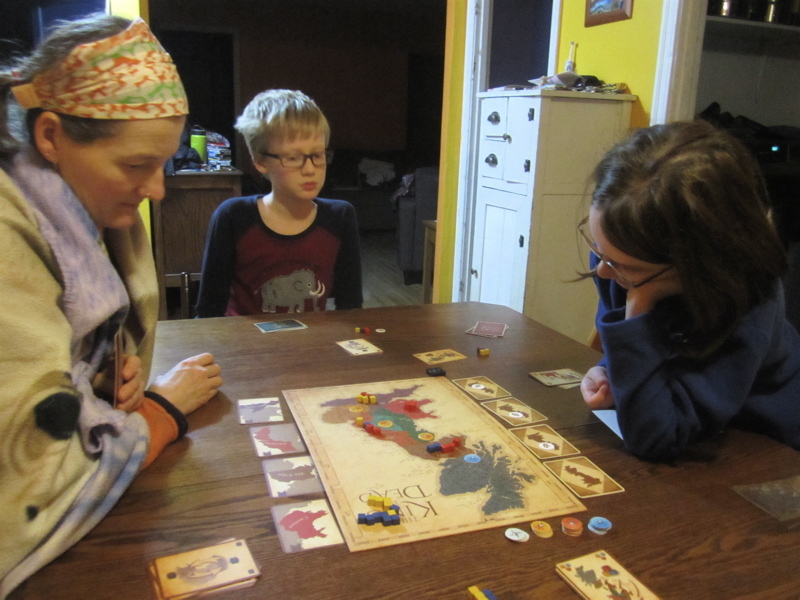 I realize it was our first game and stuff and it takes more time when learning a game... but after the first round everyone pretty much knew what they were doing and I can't imagine getting it down 1.5 hours!? It was fun enough to keep us all up to 11pm to finish it off! What was really neat was the very same day we were reading about the Inca, a fellow whose blog I follow posted about his trip to Ollantaytambo - which was pretty cool to see! I never cease to be blown away by the feats of engineering and manpower ancient civilizations managed! In The New Science we played scientists in the 17th Century competing to gain the most Prestige points to become the first President of the Royal Society. 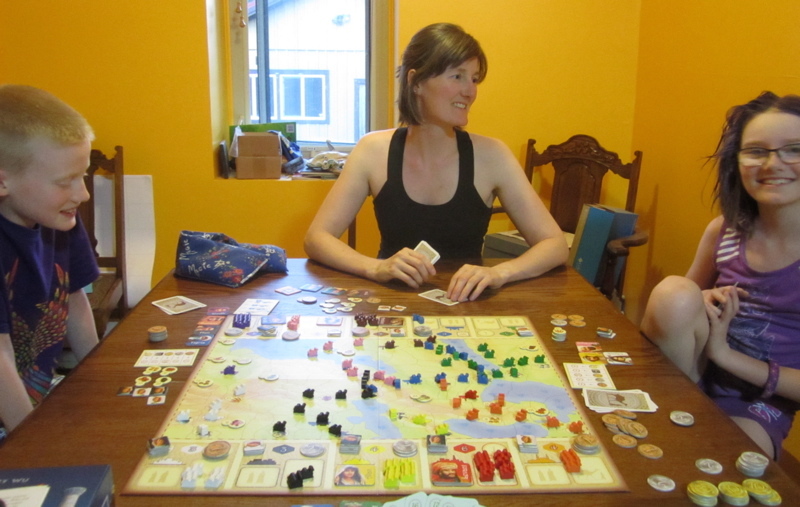 It's a very strategic game as you have to research and experiment areas of science to make discoveries - then you need to decide when to publish - publishing gains you prestige points needed to win the game, but also makes the information/technology available to other players who can then use it to further their own endeavors. And if others are researching the same field they might publish before you and then all that work was for naught as they get the Prestige Points... 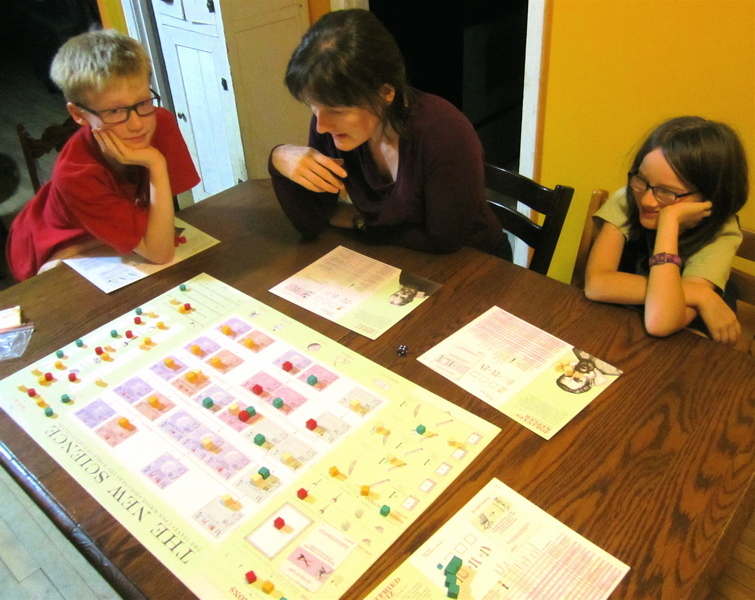 I played Gottfried Leibniz, The Girl played Johannes Kepler, Amanda played Gallileo Galilei, and The Boy played Athanasius Kircher. I liked it a lot. Each scientist has three "energy" points each turn and decides how they want to spend their energy - researching new areas, experimenting/testing areas already researched, writing up and publishing findings, gaining influence in four areas (Religion, Government, Enterprise, and Science - publishing findings for certain things requires some influence in these areas - for example to publish Heliocentrism you need to have 3 influence in religion - because otherwise you'll be excommunicated and forced to recant your findings - like Gallileo was). Moving on to other levels of research required knowledge of lover levels - either through having researched and experimented yourself or other people publishing it. The only odd this, historically speaking, is some of the scientists weren’t actually contemporaries; Galileo Gallilei and Isaac Newton are two of the scientists that can be played – Isaac Newton was born the same year that Galileo died! 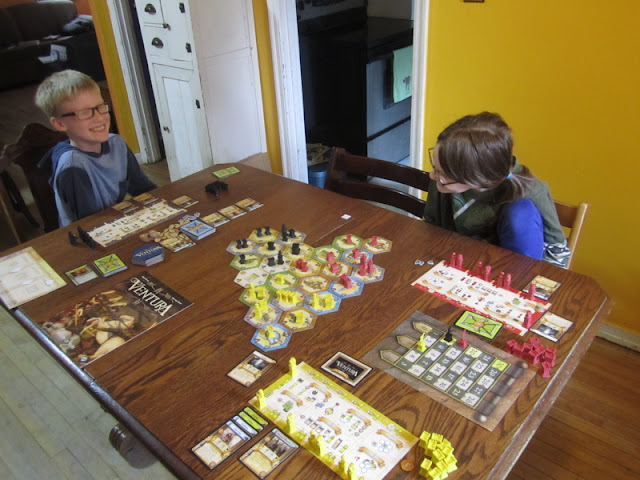 But it was a fun game that captured the essence of what was going on and had lots of things we could discuss – about how the printing press and the ability to publish findings really made all this scientific advancement possible. 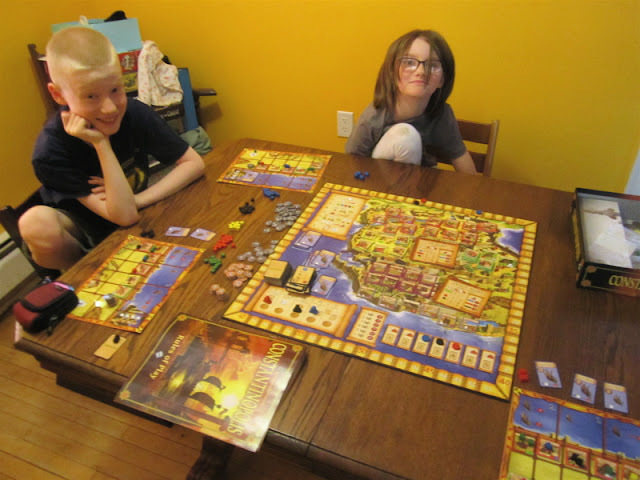 As we’d read about Magellan’s journey around the world and Vasco Da Gama’s voyage to India and the opening of the East to sea trade I thought this game might fit right in. 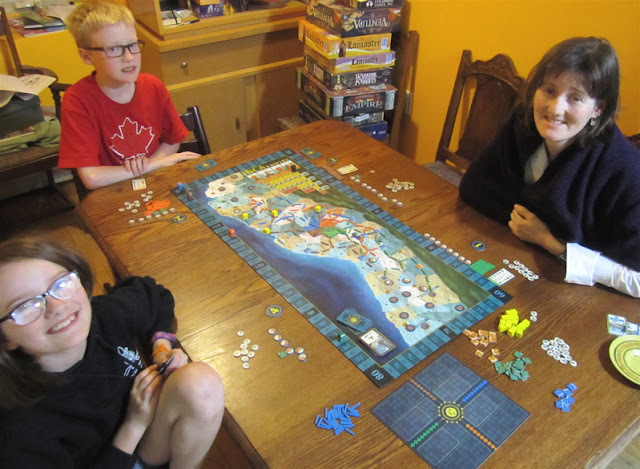 ostensibly it is supposed to be a game of up to four rival European trading companies vying to control the trade in an extended (fictional) archipelago in the Southwest Pacific. Once I opened it I discovered it was supposed to be taking place in the 1800s… ah well, it’s a fictional archipelago – we can just as easily pretend it was taking place in the 16th century!? The theme was pretty weak and the game really just another fairly abstract strategy game involving area control through placement of towers determined by drawn cards… It wasn’t terrible. 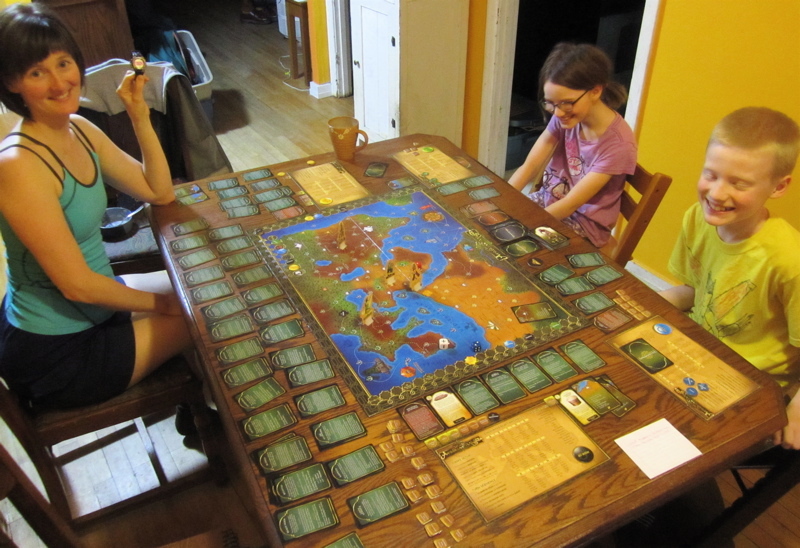 I didn’t go out and buy this one specifically for this history program (this was yet another of my $5 ebay finds from a number of years back which were generally bought with the idea of using games as part of a future homeschooling plan…). A medieval-themed game of tile-laying where you build cites and roads and score points for the completion of said cities and roads. A fun game and great for developing an ability to see patterns and find the most optimal use for a tile that you draw on a turn. But of limited history-teaching value. In this game players represent one of our powerful families in late medieval/early renaissance Italy. 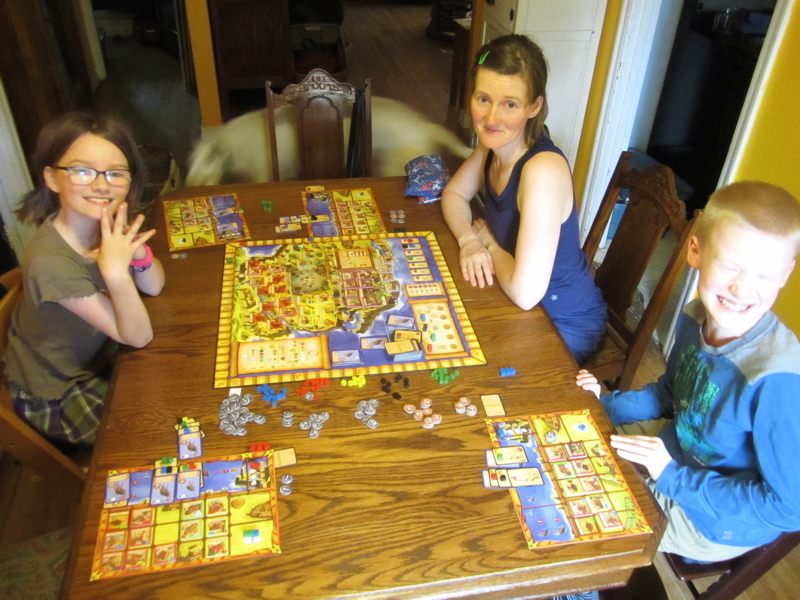 In our first game I played the Medicis, The Boy played Gonzaga, and the Girl played Este (The Visconti are the other option). Multiple paths to victory – simply taking tiles and expanding your territory worked out really well for The Girl gaining her a considerable resource base while the Boy and I were building armies – though somewhat conservatively and not making much use of them – other than to hold onto them for defence. The combat seemed a little deterministic. There was a strict procedure to follow and you could tell before entering a battle if you would win by looking at what your opponent had there. I think the game’s meant to be played considerably more aggressively than we played it. This is a quick little card game where players take in the role of a rich family in a late medieval/early renaissance (fictional) European city of Tempest (I imagine it in Italy…) vying for prestige by being the biggest patron of the arts, science, religion, and exploration… (I like any game where patronizing the arts is a good thing!) I thought it fit with our medieval/renaissance theme… The play is a fairly abstract and involves collecting of little coloured wooden cubes (which represents “accomplishments”) and cards (which represent “protégés” or fame gained through accomplishments?) which provide varying amounts of victory points which are tallied at the end of the game to determine the winner. 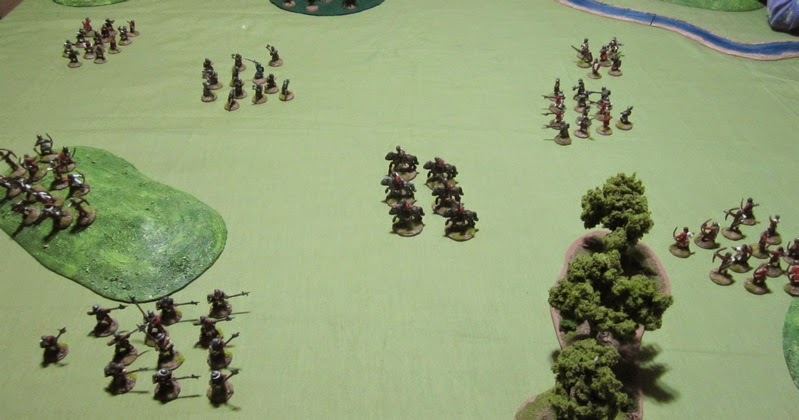 Lion rampant is a great tactical miniature game of medieval combat. I had really hoped we’d get in a game or two while reading about the medieval period. I spent a fair bit of time painting up forces to use (Here’s one: Under the Bunny Rampant Banner) we just didn’t get to sitting down for a game (for whatever reason…). 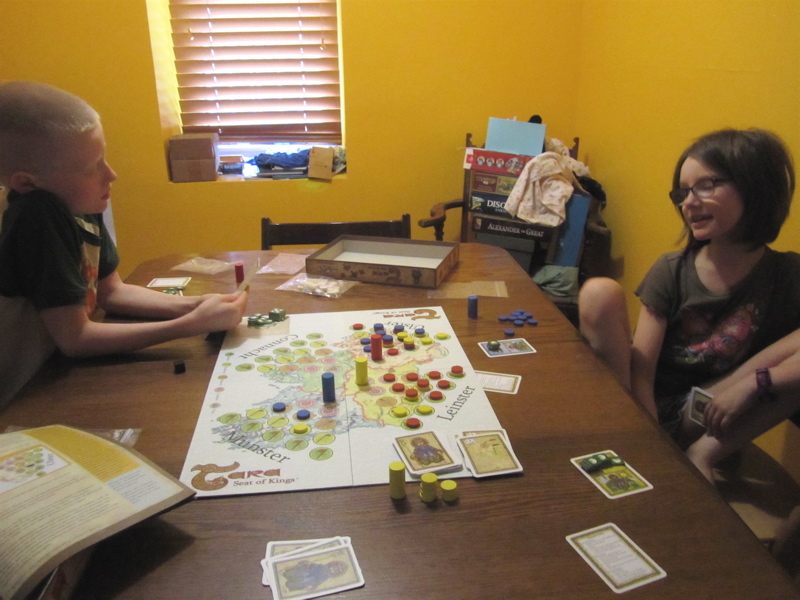 We did play the game BEFORE we started reading about the medieval period – to try it out when I first got it: Lion Rampant – First Game. Hopefully we’ll get to playing it again sometime. Set in 1338, you apparently start out playing peasants and work your way up to being par of a rich trading family. It looked interesting. 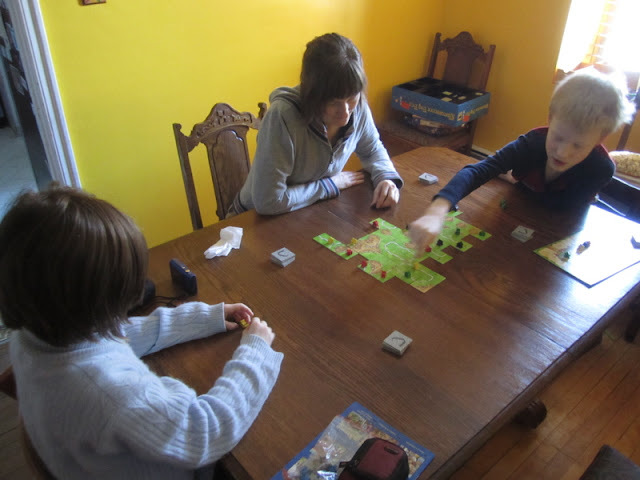 We sat down to play it one afternoon but didn’t end up having time to play it. We didn’t even end up reading all the rules. It felt very much like they were written in some other language first and maybe something was lost in the translation. I’d like to have a go at it sometime, we just haven’t had a chance yet. I haven’t been doing as much painting this last week. I did finish up these couple items for 40K. I picked these up from Dragon’s Den Games my Friendly Local Game Store a week or so ago for giggles. At $12 for 5 guys they seem a relative bargain compared to most 40K stuff… During the Fantasy Flight Games I picked up the Black Crusade RPG core rule book and I had that in mind when I picked them up (Player Characters!) – they could also be baddies in a Only War or Rogue Trader game…? Well… that’s how I justified them to myself when I picked them up. An Imperial Guard Chimera IFV that I picked up used off ebay a few years back that I’ve finally gotten around to repainting. One is kind of useless… I do have a second one. Should I get to the point when I have enough troops that I could mechanize a whole platoon I should start looking for a couple more on ebay. Troops debussed from their armoured transport and advancing with some more heavy support. I kind of feel like I should have done some more weathering and included some tactical signs or something… I guess I could add that later. The tactical signs can wait until I actually have a unit of them, I suppose…? 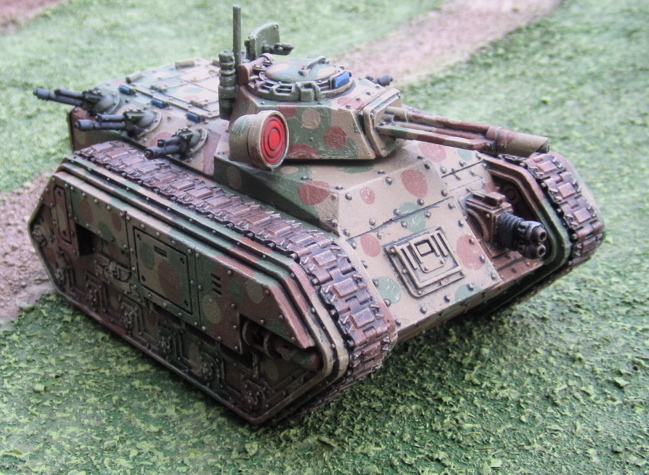 I also have a Leman Russ tank that I recently picked up off ebay that I’ve primed over and kind of feel like painting… but I should probably finish up the last few jungle fighters. More 40K stuff likely. 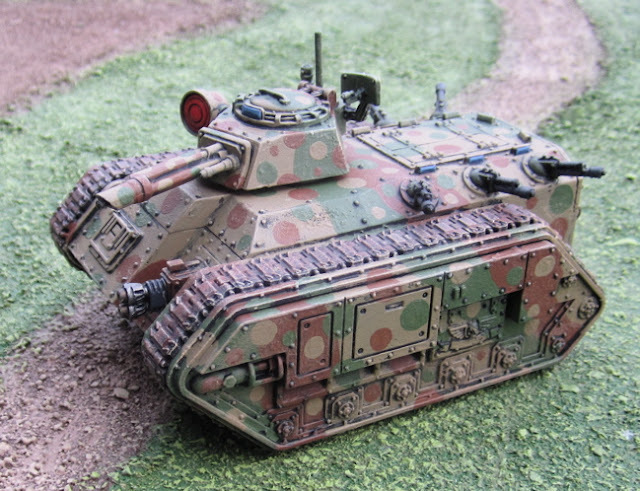 I have the last few Jungle Fighters on the workbench along with the aforementioned Leman Russ. But I also have a few eldar and tau and other odd and assorted bits… who knows?! If the order I placed with Wargames Foundry shows up there could very well be a bunch of assorted swashbuckler-types showing up here in preparation for the immanent release of En Garde! 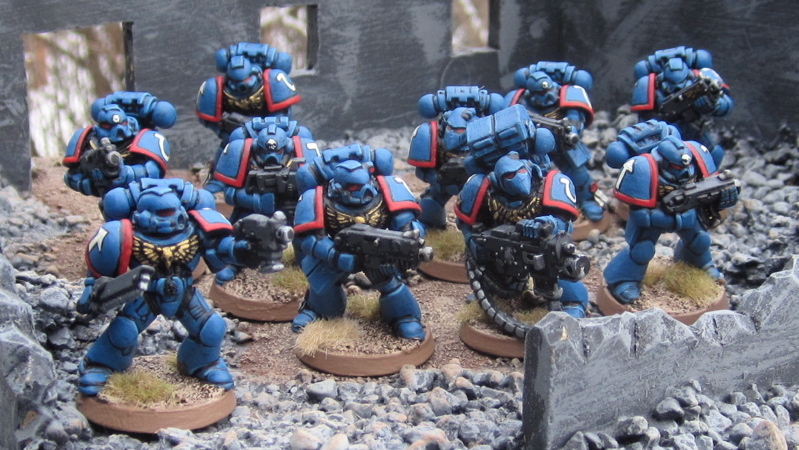 One Tactical Squad of Ultramarines from the 3rd (Battle) Company. Just a Quick Update – More 40K, etc. I had hoped to get some Seven Years War stuff painted as we approached the period in my history reading with the kids… but we just blew past the Chapter that covered the Seven Years War this past week (which also covered the later wars of Louis XIV, The War of the Spanish Succession and the War of the Austrian Succession…) Last Monday we started in on the American War of Independence (it seems there were TWO chapters covering that…?!) and ended the week with the French Revolution. This week we’ve started with Steam and Coal in England and the Rise of Napoleon… I think we end the week with the Downfall of Napoleon and the War of 1812. I’d like to have lingered in the 18th Century a bit longer, but I’m on a mission to finish this volume before the New Year. We will return to the period – and others we didn’t get to explore thoroughly enough – when we finish up the general survey of history. A few more Jungle Fightin’ Imperial Guardsmen; one squad plus a few extras for Other squads and Special Weapon teams. Two not-so-jungle-fighter Imperial Guard platoon commanders. I’m not a fan of plastic slotta bases. 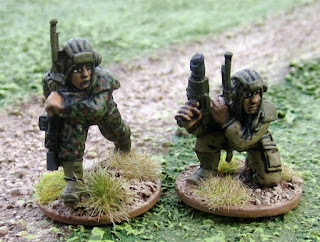 A look around this blog will tell you I base most of my (individually-based) figures on washers. What these guys are commanding, however, are hoards of plastic Imperial Guardsmen on plastic bases. 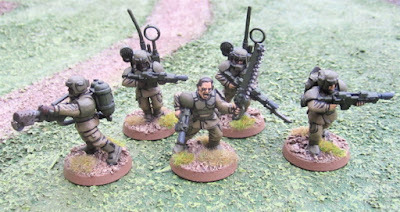 If I put them on a washer – like I do with most other metal 28mm figures – they would be considerable shorter than the troops they command!? Two Imperial Guard Crewmen. I did one in the jungle camo in case I ever wanted to have a Sentinel crewman dismount and run about. 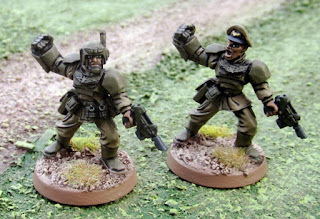 More of the same – the last of the Jungle Fightin’ Imperial Guard…. 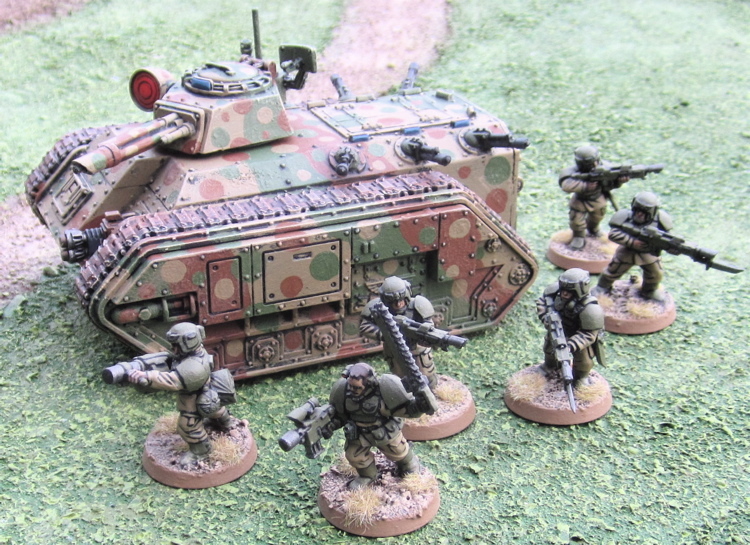 Other Not-So-Jungle-Fighter Imperial Guard stuff… maybe even some Eldar, Chaos, Space Marine and Orky stuff! ?